This book provides readers with the principles and best practices in spatial audio signal processing. It describes how sound fields and their perceptual attributes are captured and analyzed within the time-frequency domain, how essential representation parameters are coded, and how such signals are efficiently reproduced for practical applications. The book is split into four parts starting with an overview of the fundamentals. It then goes on to explain the reproduction of spatial sound before offering an examination of signal-dependent spatial filtering. The book finishes with coverage of both current and future applications and the direction that spatial audio research is heading in. Parametric Time-frequency Domain Spatial Audio focuses on applications in entertainment audio, including music, home cinema, and gaming—covering the capturing and reproduction of spatial sound as well as its generation, transduction, representation, transmission, and perception. This book will teach readers the tools needed for such processing, and provides an overview to existing research. It also shows recent up-to-date projects and commercial applications built on top of the systems. 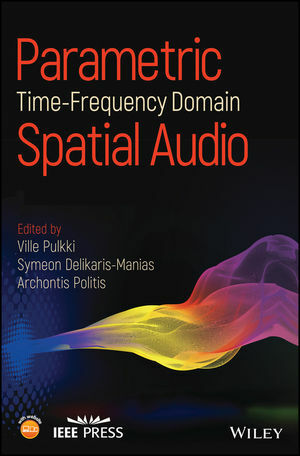 An advanced book aimed at readers who are capable of digesting mathematical expressions about digital signal processing and sound field analysis, Parametric Time-frequency Domain Spatial Audio is best suited for researchers in academia and in the audio industry. VILLE PULKKI, PHD, is an Associate Professor leading the Communication Acoustics Research Group in the Department of Signal Processing and Acoustics, Aalto University, Finland. He has received distinguished medal awards from Society of Motion Picture and Television Engineers and from Audio Engineering Society. SYMEON DELIKARIS-MANIAS is a postdoc researcher affiliated with the Communication Acoustics Research Group in the Department of Signal Processing and Acoustics at Aalto University, Finland. ARCHONTIS POLITIS, PHD, is a postdoc researcher affiliated with the Communication Acoustics Research Group in the Department of Signal Processing and Acoustics at Aalto University and Tampere University of Technology in Finland.